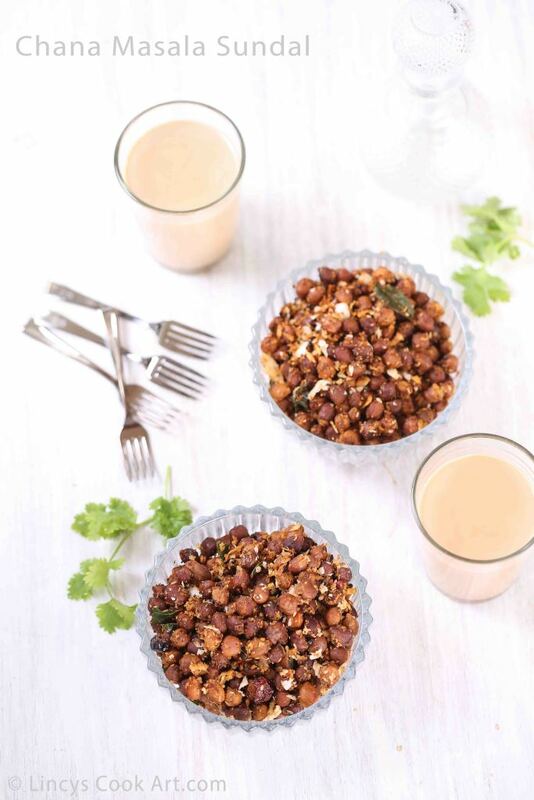 Chana Masala Sundal| Kondakadalai sundal| Kala Chana Masala Sundal| Chickpes masals sundal is an easy to make spicy variation to the plain sundal with coconut. Sundal Masala adds more flavour and a fresh taste with a totally different dimension to the dish. Tastes amazing and the leftovers could be used as a side dish for rice as it is bit spicy as well.This same recipe can be followed for the white chana too. As i said in my earlier post I learnt this masla sundal recipe from my neighbour Uma Bala. I used to clarify my doubts in the tamil cuisine with her. Her tip on this sundal masala which could be used to make variety rice with capsicum, brinjal, beans..etc like veggies on the vrat days without onion, or garlic. Soak the black chana overnight or minimum 6 hours. Pressure cook them with some salt for 3-4 whistles. Once the pressure releases open the cooker and drain the excess water. Heat oil in a pan and add the mustard seeds with urad dal; once the mustard seeds splutters and the urad dal tuns golden add the broken dry red chillies, curry leaves and hing. Now add the ground powder and mix in that oil to cook for a second. Add the cooked black chana and salt if required. Finally add the grated coconut and mix well before switching off the gas.